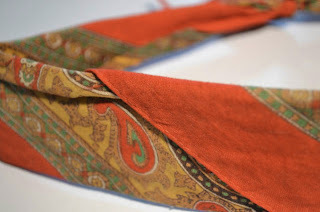 Making My 7th Doctor Costume: Original 7th Doctor items - on eBay! Over the past couple of weeks there has been a small flurry of original Seventh Doctor Props and costumes for sale on eBay. It’s been like a mini Bonhams auction! 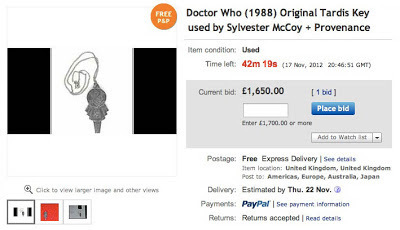 Original Tardis key used by Sylvester McCoy as the seventh Doctor during the 1988 season of Doctor Who. 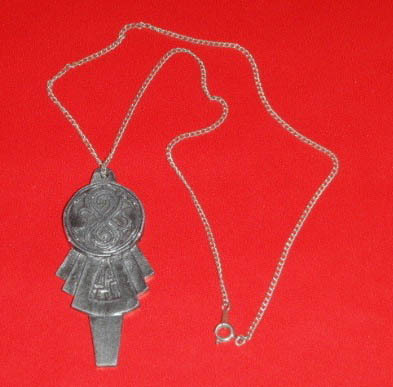 Provenance : comes with a statement of authenticity from Mike Tucker "Miniature Effects Supervisor", confirming he made this original prop during the 1988 season of Doctor Who, was one of several made all were used at different times by the production. 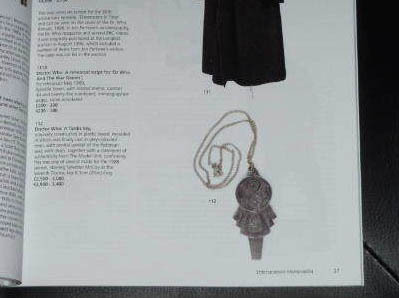 Lot 112 Bonhams Entertainment Memorabilia (Wednesday 29 June 2011). 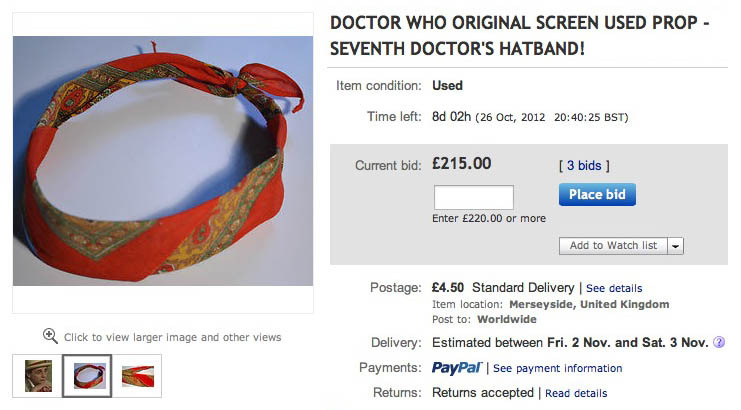 This is one of the hatbands worn by Seventh Doctor, Syvlester McCoy during his tenure as the Time Lord. 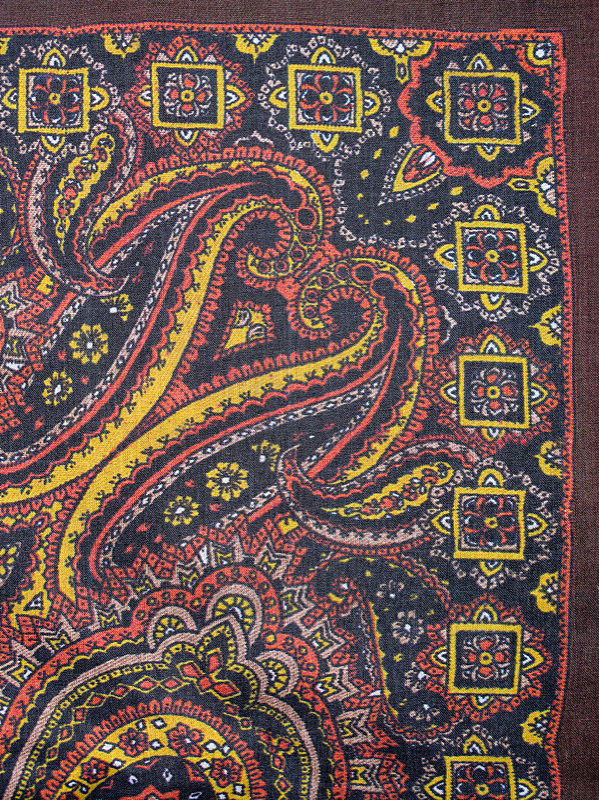 It was obtained at a Longleat auction hosted by John Nathan Turner on Sunday 1st August (I’d love to tell you which year but the accompanying sheet doesn’t say it!) where it was item number 4 to be sold. Here we have an original screen used prop from the 1987 Doctor Who story Time and the Rani, the 1st story to feature Sylvester McCoy as the Doctor. 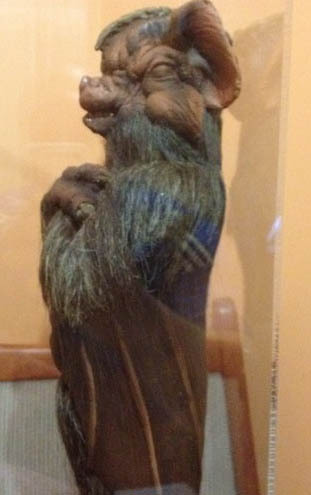 This particular prop is a miniature Tetrap, the bat-like creatures seen throughout the story. 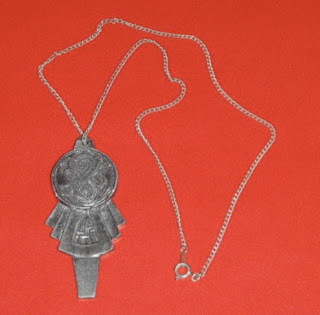 This Tetrap was used in the scenes where Tetraps were seen hanging from the ceiling of the Tetrap cave, and can also be seen on the cover of the novel of Time and the Rani. 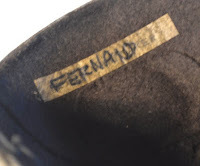 This prop is in absolutely fantastic condition, and is now over 25 years old. The Tetrap Is made from sturdy foam latex, and is covered in faux fur. The latex is in absolutely superb condition with no cracks whatsoever. The Tetrap is about 20 inches tall, and is a perfect size for a display prop. 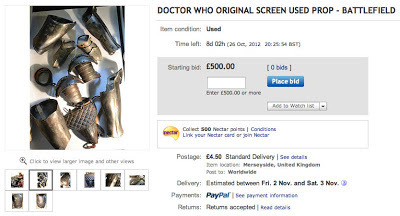 I bought the prop directly from the owner of www.doctorwhoprops.com, the best buyer and seller of original Doctor Who props known to man, who will confirm that this prop is 100% original and 100% screen used. 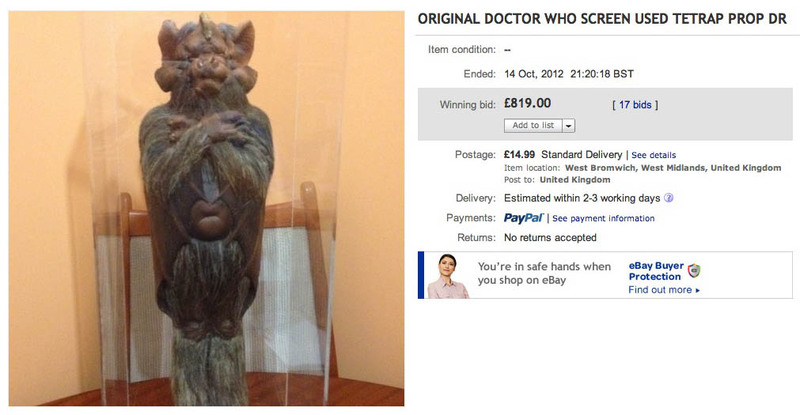 This is an absolutely excellent example of a typical 1980's Doctor Who prop. The Tetrap also comes with its own professionally made custom display case. 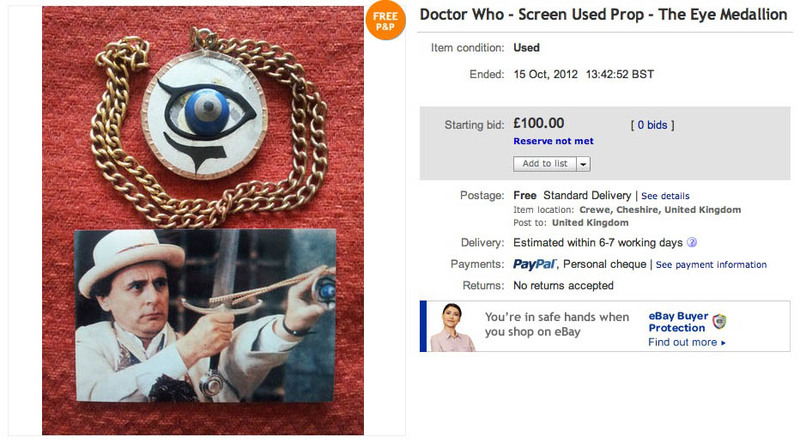 I had the case made shortly after purchasing the prop, by a company called Widdowsons, and cost over £100 on its own. The case measures roughly 22 inches tall, 8 inches wide and 7 inches deep. It is made of ultra-violet resistant perspex which protects the contents of the case, and the base is wooden with a soft finish on the inside. Very rare to have a Doctor Who costume on eBay, even more rare for it to be of a character and not one of several guards etc. Here is Howard Cookes costume for PEX from Paradise Towers. This was purchased by myself at the Bonhams auction 11th May 1991 and has been kept safely ever since. In great condition, the tears you can see in the photos are the purpose 'designer' ones to make it look like PEX had been living rough etc. This is a Killjoy mask from the classic 1988 Doctor Who story, the Happiness Patrol. 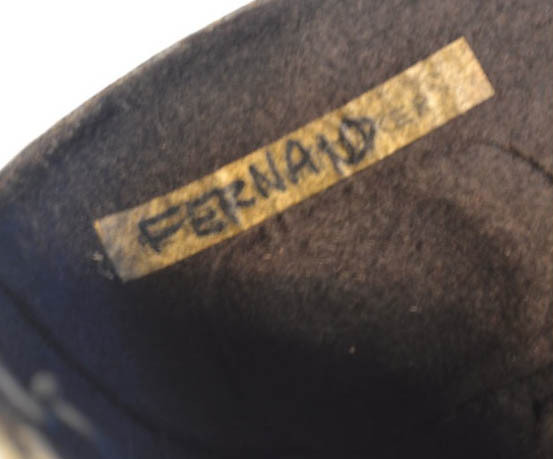 ‘Fernand’ is written on a label inside the mask over someone’s name – which is difficult to read but looks like ‘Whitaker’? 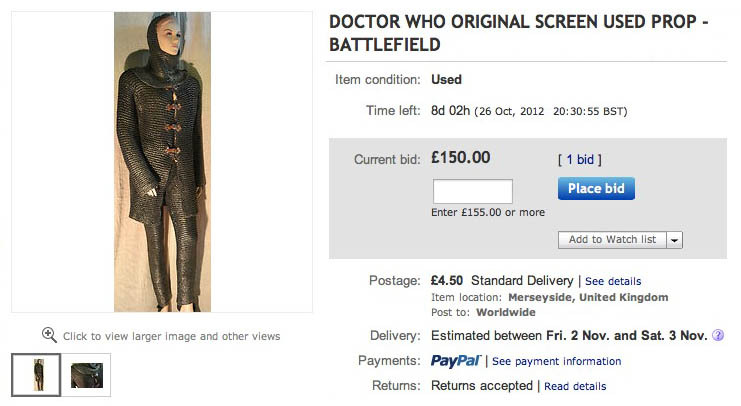 Don’t miss this chance to own an authentic piece of Doctor Who history! Original screen used prop from Doctor Who the Happiness Patrol. Trevor Sigma's i.d. Pass. Complete with signed card from John Normington confirming authenticity. Beautiful display items. Sent to my brother when he wrote to John. 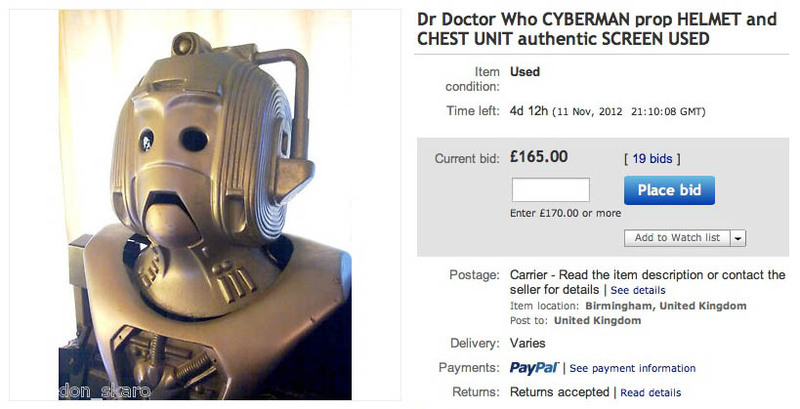 This auction is for a cyberman helmet and chest unit of fibreglass construction, and as such comprises of two separate items. Both items combine to constitute one single prop. I will not separate this prop to sell either component separately as they have been together since manufacture and are sibling parts. This prop is old; it dates back to at least the early 1990s and is showing its age. 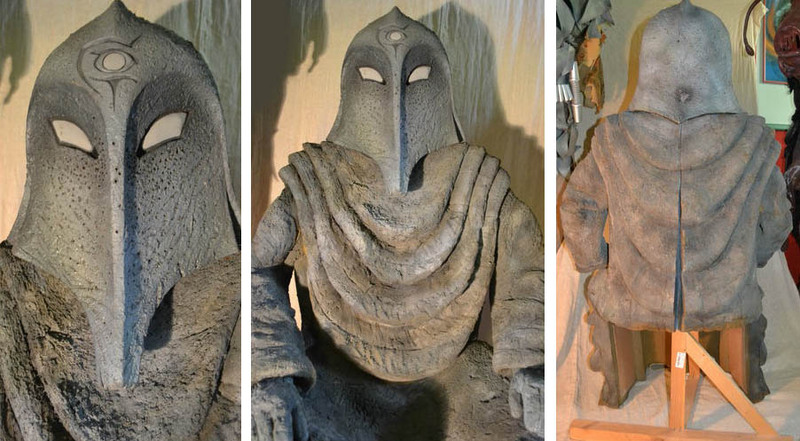 It was originally the property of Special Effects artist Steve Gostelow, and was used in the BBC documentary ’More Than Thirty Years in the TARDIS’. Both helmet and chest unit were also later displayed for a time in the Doctor Who Exhibition at Blackpool as a ‘dead cyberman’. 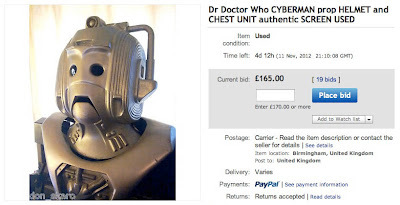 This prop clearly started out its life as a ‘Silver Nemesis’ style helmet and chest unit, but was modified to resemble the cybermen as they appeared in ‘Attack of the Cybermen’ for use in the ‘Thirty Years…’ documentary. 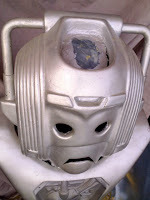 The perspex ribbed chin was replaced with a solid resin one, and the helmet’s crown light (non-functional) also replaced with the squarer version from earlier cybermen. The back-plate clips into place, and there is no evidence that it was ever fastened to the helmet using screws (I understand that all helmets of this type used on the actual Doctor Who programs ‘Attack of the Cybermen’ and ‘Silver Nemesis’ were screwed into place). 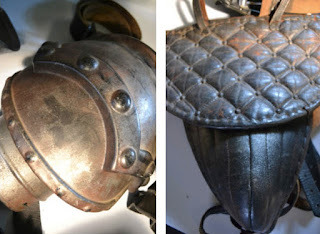 There is also no evidence that helmet and chest unit were ever chrome in colour, but both have clearly undergone more than one re-spray with silver paint. It is not suggested that this prop was made for or used in the filming of ‘Silver Nemesis’, but was cast from screen-used BBC prop moulds sometime during or shortly after the closing years of Doctor Who’s original run and used for television and exhibition purposes later . 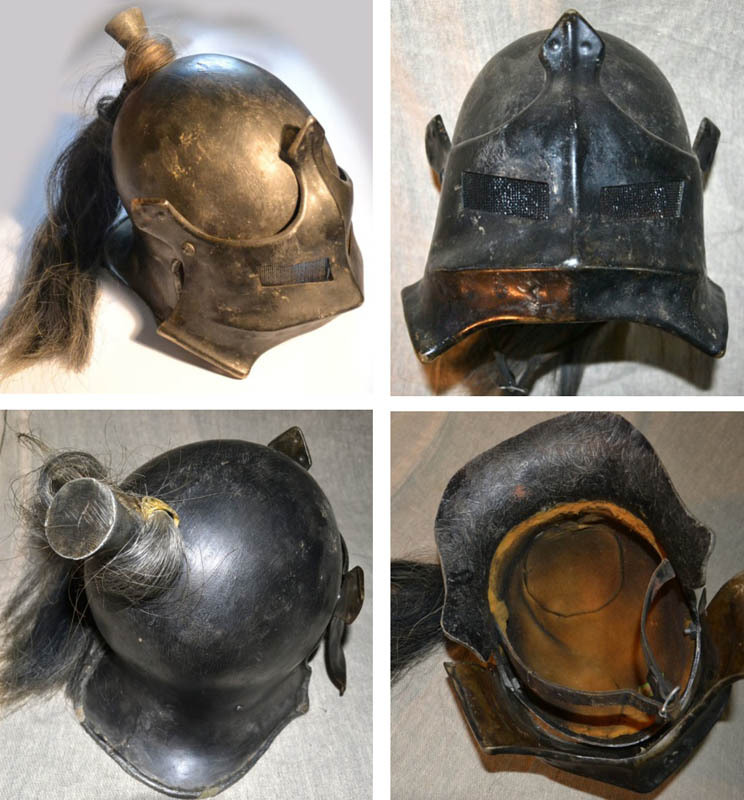 Compare the photographs here with those of screen-used helmets on http://www.doctorwhoprops.com/costumes to see that all the symmetry, even the grooves on the earmuffs, line up exactly. This is not an officially BBC licensed replica, and if you're looking to own a pristine and beautifully-crafted display piece taken from original BBC moulds then I whole-heartedly recommend http://www.thisplanetearth.co.uk. 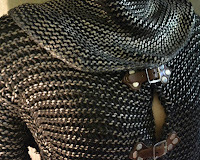 I own several of their pieces myself and cannot speak highly enough of their superb work. 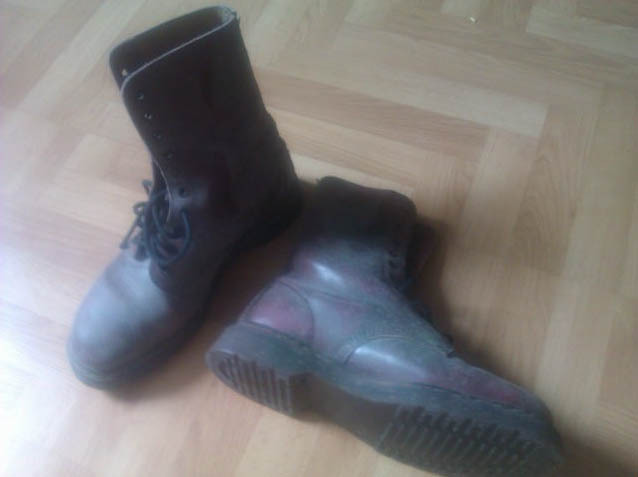 This is an authentic screen-used and exhibition-used prop, showing considerable wear-and-tear from twenty-or-so years of use. It is scuffed, chipped, has clearly been patch-up on several occasions with running repairs particularly evident on the helmet interior, and proudly shows its history in its very fabric! 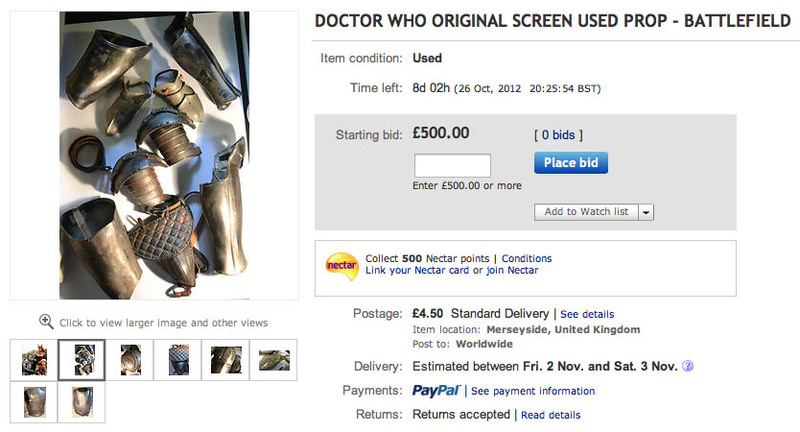 This is a unique opportunity in owning an original, authentic, screen used television prop from Doctor Who. The Eye Medallion was used by the 7th Doctor when fighting the Gods of Ragnarok in the arena. This piece was purchased in a Doctor Who auction at a Longleat Doctor Who day in 1996 and is one of a pair made specifically by the BBC Special Effects team for this story. 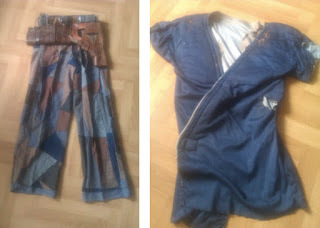 As you will see the item is in good condition and is exactly how I purchased it in 1996. 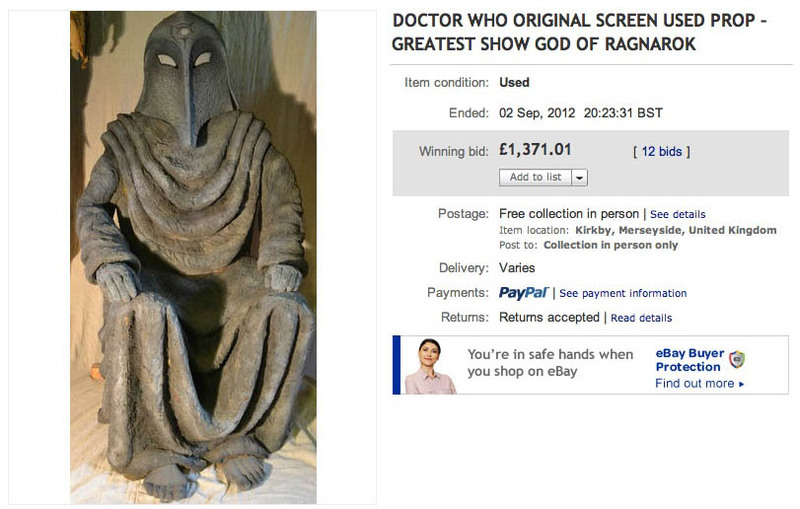 This is one of the Gods of Ragnarok from the 1988 classic Doctor Who story, The Greatest Show In The Galaxy. It is in remarkable condition for a prop of this age, with very little wear and tear evident – he’s got a scuff on his right foot little toe - that really is about all! Made from foam and fibreglass, it’s a very light prop and could easily be transported in a decent sized car. I can arrange courier delivery although this might be expensive depending where you live. Don’t miss this chance to own an authentic piece of Doctor Who history! 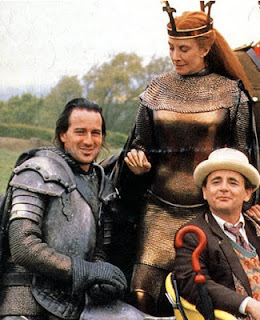 This is an (almost) complete set of armour from the classic 1989 Doctor Who story, Battlefield. 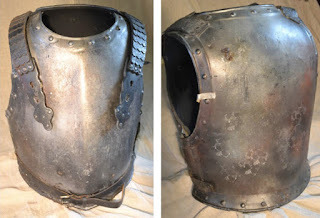 It consists of: two fibreglass body pieces held together by a leather belt and thick leather shoulder straps; moulded pieces to cover shoulder and upper arm, thighs and lower legs. There are also armoures boot covers and an...erm...codpiece. It is made to a very high standard with all joints elasticated and articulated to allow the actor underneath to move as freely as possible. It looks very impressive on display but is surprisingly lightweight. And it’s survived pretty well for 25 years, with a few minor scuffs which may well have happened during a fight sequence! The only major damage is a couple of splits across the knees which are the weakest part of the construction. The armour was assembled from various sources over the past 10 years, including a Longleat auction and some trading with fellow collectors, one of whom informed me the chest plate is very likely to be that worn by the major character Mordred. 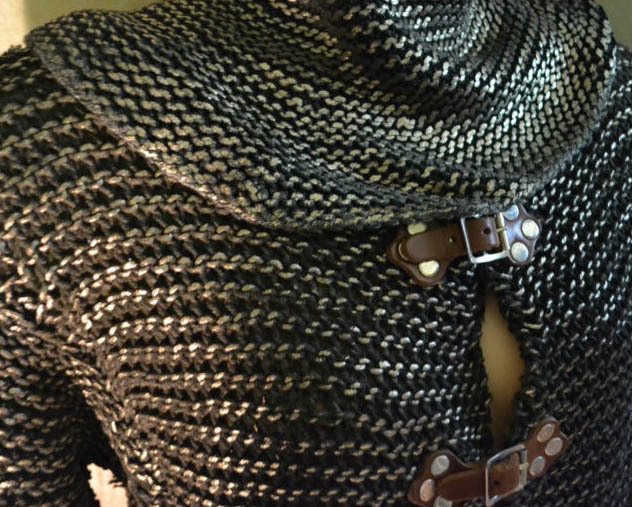 This is a "chainmail" suit from the classic Doctor Who story Battlefield. It consists of a long jacket (held closed with buckles), trousers (held up with braces) and a hoody-style head cover. 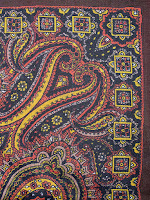 It is made from a thick wool which has been overpainted on raised areas to give it an authentic look - it is still pretty heavy!